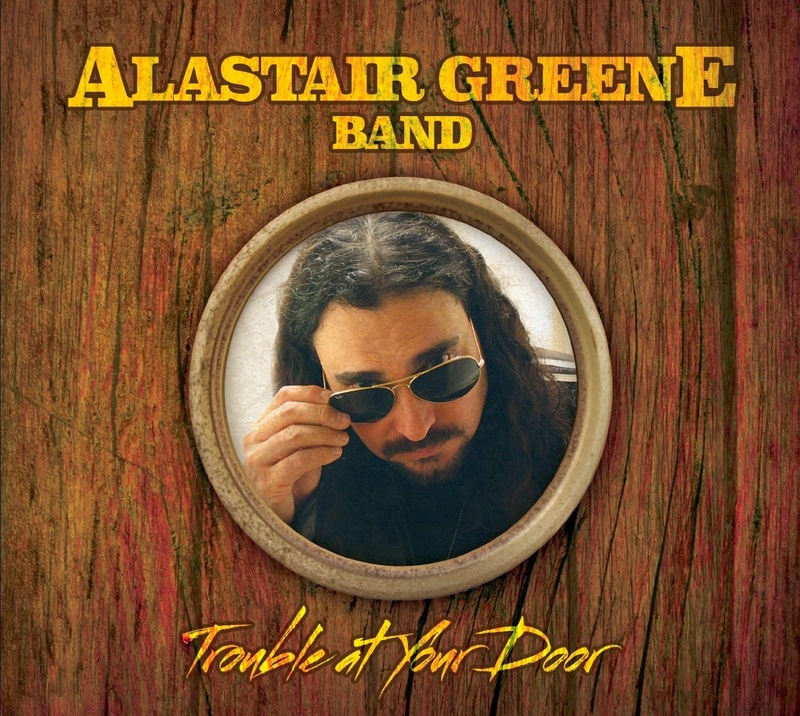 I just received the newest release (June 17, 2014), Trouble At Your Door, from Alastair Greene Band and it ripps! Greene, well know as a session player and with a number of releases under his belt has really hit the screws on this one. Opening with People, a modern track with essential roots in the blues with drone noting sets a high bar for the rest of the release with hot slide work and a solid beat. On the title track, Trouble At Your Door, a Funk 49 like track, Greene gets things moving right. A funky blues rocker, Green had band mates Jim Rankin (bass), Austin Beede (drums) and Erik Norlander (organ) with him all the way as he lays down some really hot blues rock grooves. This is a great track and gives Greene a good basis to demonstrate his hot guitar skills. Boogie track, Back Where I Belong maintains an essential primitive blues root with a modern polish. Greene is vicious with his slide work and literally puts on a clinic on this release with crisp riffs and fresh phrasing. Red Wine Woman finds Greene on a steel bodied resonator playing delta style. His fluid riffs and clear sense of direction makes for a really cool track. First Born Son is back to full bore electric with a heavy bottom a southern kick. Using both slide and straight lead work on this track, Greene shows why he deserves to be mentioned in the list of top blues rock guitarists today. Love You So Bad is a quick paced blues rocker with just a hint of country. With twin guitar/vocal leads, this track is hot and Greene takes a nice opportunity to blow the doors off with every riff in his armament. Last Train Around The Sun has a cool Texas feel (Jesus Just Left Chicago) with a number of different twists and turns. Using full amp distortion guitar tones are creamy and full with lots of grind. Hot blues riffs blended with modern picking techniques really sets this track off. Excellent! Calling For You is a quiet, nicely constructed ballad backed primarily by Norlander on keys. With more of a David Gilmore like attack on guitar this is a really nice contrast to the balance of the release. Make The Devil's Day keeps in the blues vein but has more of the drive or Robin Trower or Chris Duarte. A cool blues rocker, this track should have a lot of commercial appeal. Greene never lets you down, always playing his guitar to the max without overcrowding. Very nice. Strange Feeling is a rocker with an easy attack. Building a lot of sting with guitar, bass and drums; and blending shredding techniques with blues overtones, Greene really controls the sound nicely. Pretty Price To Pay has a funky rock sound and Greene works his vocals nicely into the groove created by his trio of fine musicians. His fingers dancing lightly across the fretboard in a jazz like manner but with stinging results this is a really nice sound. Wrapping the track is The Sweetest Honey, a pure blues rocker with a solid rhythmic hook. Using a Chuck Berry rhythm as the base with Cream like guitar solos this is a hot track and a great way to conclude possibly Greene's effort yet!